Researchers Test Microbe Wipe To Promote Babies' Health After C-Sections : Shots - Health News A small study suggests that slathering newborns with their mothers' microbes after cesarean sections could help create healthy microbiomes. Reducing childhood illness later on is the goal. When a baby is born by cesarean section, she misses out on Mom's microbes in the birth canal. Babies get a lot from their mothers. But babies born by cesarean section don't pass through the birth canal and miss out on the benefits from picking up Mom's microbes on the way out. How? By slathering babies just after birth with a gauze pad that soaked up the microbes in their mothers' birth canal right before birth. "These results show that we can partially restore and normalize the microbial assembly that takes place naturally in babies," says Maria Dominguez-Bello, an associate professor of medicine at the New York University School of Medicine, who led the study. "We normalize their microbiome." Dominguez-Bello and her colleagues stress that they need to test their approach on many more babies to really know if it works. Scientists also need to follow the children for years to see if the intervention makes any difference to their health. In the meantime, they emphasize that women shouldn't attempt this on their own because there is a risk they could inadvertently transmit dangerous bacteria to their newborns. "Don't do this at home," says Jose Clemente, an assistant professor of genetics and genomic sciences at the Icahn School of Medicine at Mount Sinai in New York, who helped conduct the study. The women participating in the study were screened for known pathogens ahead of time and also given antibiotics as a precaution. When a woman is pregnant, the composition of microbes in her birth canal starts to change. "Babies pick up these microbes. And by time the baby's born, the baby's heavily colonized by these microbes that have found the right place to grow," says Dominguez-Bello. 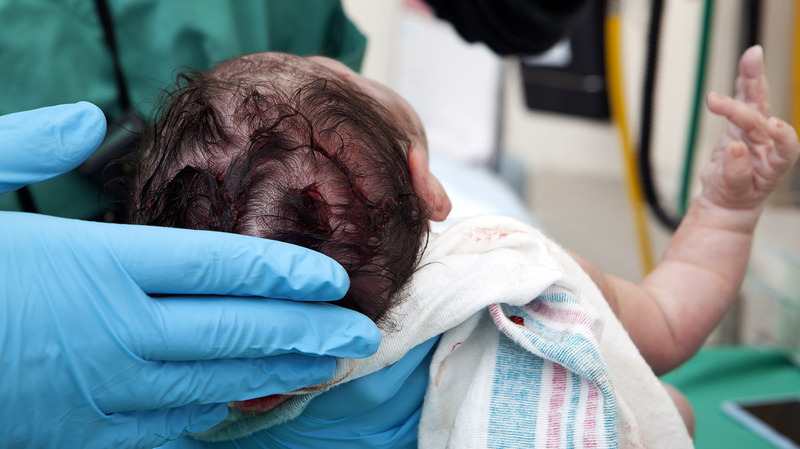 Babies who are delivered with a C-section don't go through the birth canal, so they don't get these microbes. That might help explain why babies born by C-section appear to have a higher risk for a variety of diseases, she says. "We think that the epidemic increase in asthma, allergies, Type 1 diabetes, Celiac disease, obesity are related to disturbances in the microbiome," she says. The hypothesis is that microbes help train the immune system. The link to obesity may stem from microbes helping to regulate normal metabolism. So Dominguez-Bello and her colleagues wondered whether they could somehow give C-section babies their mothers' microbes. "We are testing the hypothesis that if a baby born by C-section is exposed to vaginal fluids of his or her mom, then those bacteria that the baby should have seen naturally will find and grow in the appropriate niche of the body," she says. Other researchers say the results represent a promising first step. "It's a very important study," says Juliette Madan, who studies babies' microbiomes at the Dartmouth Geisel School of Medicine and who isn't involved in this study. "It's showing that this is a possible intervention that might restore a health-promoting microbiome and lead to improved health outcomes for life," Madan says. For the study, which is ongoing, researchers ask doctors to put a piece of gauze inside the birth canal of women giving birth by C-section before delivery to soak up their microbes, and then take out the gauze just before the baby is born. As soon as the baby is born, the doctors swab the baby with the specially prepared gauze, focusing on the mouth and face before moving onto the rest of their body. The researchers then repeatedly sample and analyze the babies' microbes. The results released Monday focus on the first four C-section babies they tried this on, during the first month of life. The researchers compared their microbes to those of seven C-section babies who weren't swabbed and seven who were born vaginally. All together, the scientists collected and analyzed more than 1,500 microbial samples. The mouth, gut and skin microbes of the C-section babies who were slathered looked much more similar to those of babies delivered vaginally than those who weren't swabbed in their first month of life, the researchers reported. For example, the swabbed babies had greater quantities of two types of bacteria believed to be helpful, known as Lactobacillus and Bacteroides. The swabbing didn't completely re-create the combination of microbes present in babies delivered vaginally, however. The researchers have performed the procedure on more babies but haven't yet completed the same analysis. The group is seeking funding to continue and expand the study to try to determine how well the approach works and whether it improves health, which is the ultimate goal. "Obviously, the final study — the most important one — is to follow babies for three or five or seven years and determine if this restoration decreases the risk for some of the diseases that we know are associated with having been born by C-section," Dominguez-Bello says. If that turns out to be the case, the researchers said, they would try to develop a probiotic that contains the specific microbes that babies need. That would eliminate the risk of transferring any harmful microbes to the babies.